Another is my abstract study series. Started with complementary blues and oranges and just went from there. This started as a demonstration in one of my workshops. 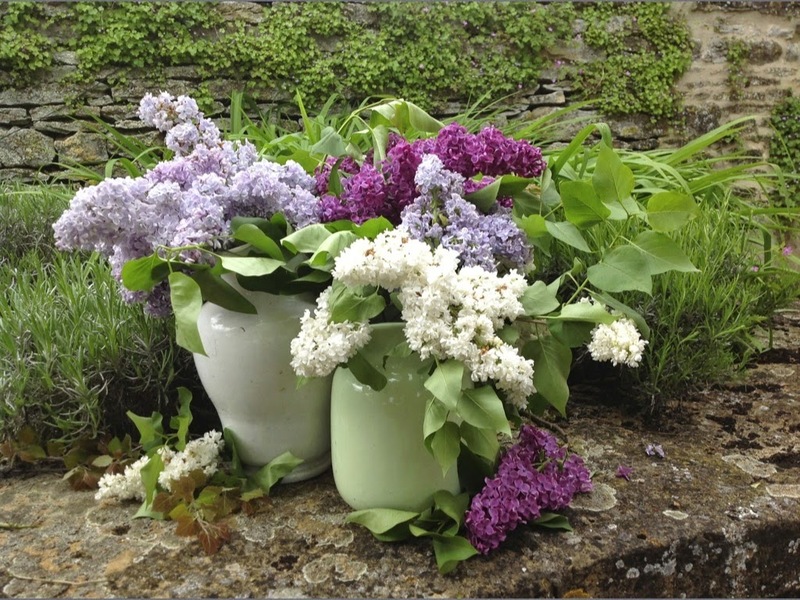 I had wanted to demonstrate on how to handle white flowers which have their special challenges. Unfortunately we had no white flowers to paint so I took some yellow flowers in this simple set up and started the demo. How hard could it be to translate those to white flowers I thought. Well easier said than done! When the eye sees yellow it really takes something to paint white. 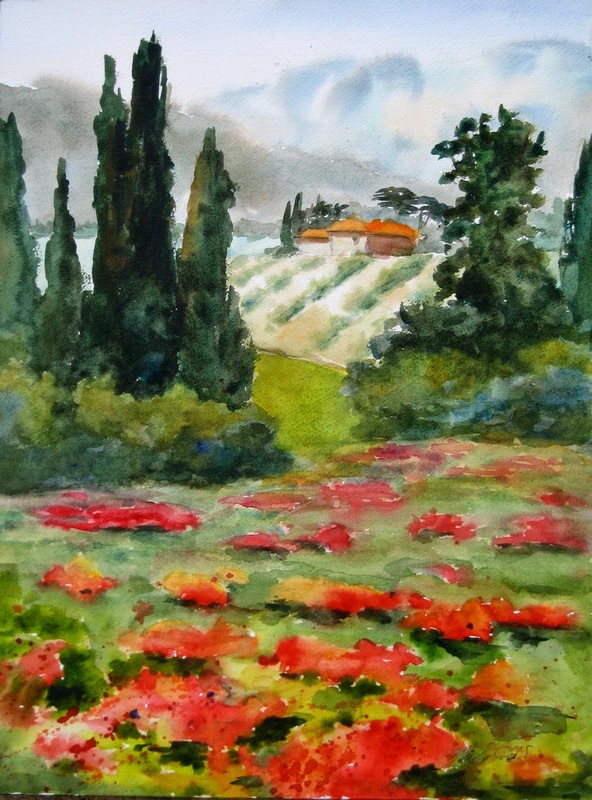 I took a painting workshop from Ovanes Berberian in France a couple of years back. He shared 2 different methods of working in oils. One had been similar to an approach I'd been comfortable with before, which involved transparent washes underneath then opaque/thicker paint on top. His medium and approach was a bit different from what I'd been doing, but not radically so and I've since integrated some of what he shared into my regular painting process. This weekend, I watched a video of one of his demonstrations and realized he used the other method, which I had never actually tried, so I decided to give it a go today. I went back to one of the reference photo's from that trip, a beautiful collection of lilacs. I began as he did with the alternate method which is to tone the canvas with a mixture of diluted thalo blue and grey ( sounds shocking already). Then lightly draw in placement of objects. 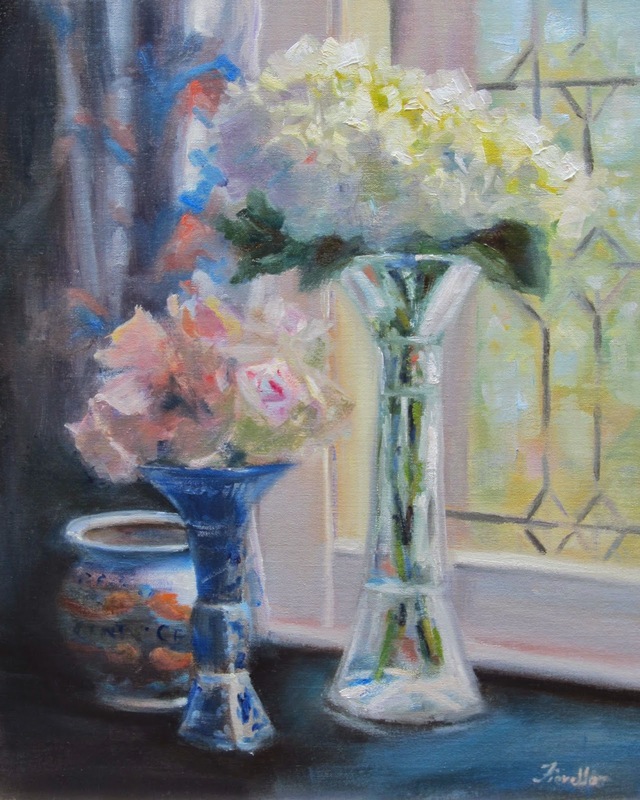 start painting vases, greenery, then the flowers both the shadow side and the halftones of the lighter side, but reserving the true lights for the end. One of his quotes was a good reminder "without the halftones, there is no where to go with the light". All in all I was pretty pleased with the process and the finished piece. It was not that hard to adapt to a totally different process. It was worth letting go of the familiar and comfortable approach which seems to be working and I expect to continue to integrate this into my painting repertoire in the future. Starting with the new approach. A new larger painting. Different light source from the window as opposed to my usual still life set ups where I often set up direct, dramatic lighting. 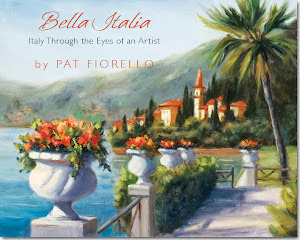 A woman had seen one of my paintings of Italy and wanted it for a room she is redecorating, but she needed to have another piece the same size to go with it. The gallery called and asked if I had anything that size, but I didn't. So I created this companion piece "Up the Road". Glad to hear from the gallery that she already came by and loves the pair. Know that artists can help you create the perfect piece of art for your home. Sometimes you just have to ask for what you want- anything is possible! I love to do commissions. If there is something special you want for your home or for a gift, it never hurts to ask! Cropped in a little closer for this elongated format. Wanted to keep it a little less detailed while focusing on the light and shadow of my "star" sunflower. 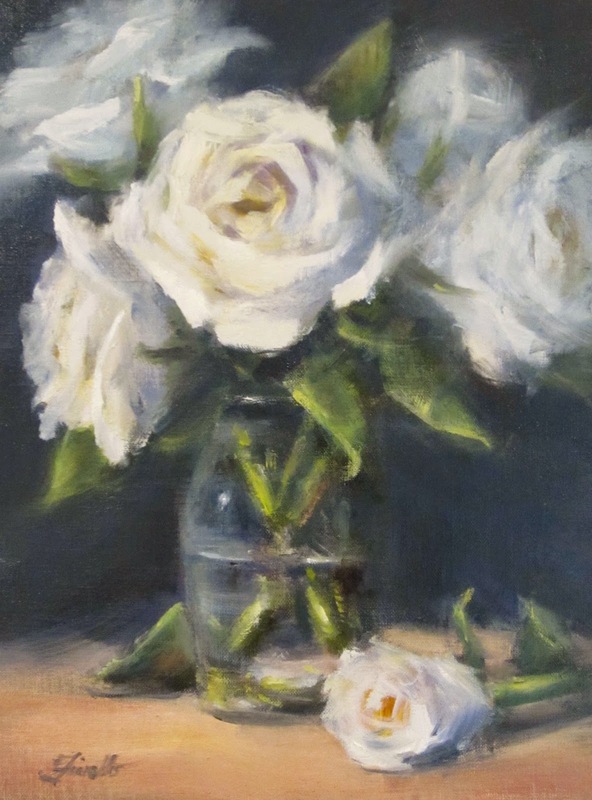 "Lilies and White" is an example of one of my "Forever Bouquet Paintings". 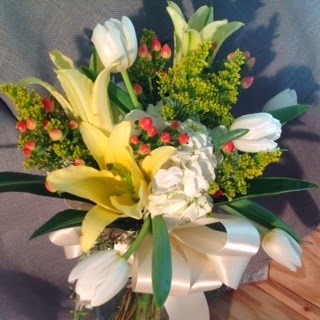 This bouquet was designed by John Grady Burns of jgb flora. It had a real "Spring" feel to it with the dominant colors-yellows, yellow-greens and the choice of flowers- lilies and tulips, so I decide to add a complementary lavender background to reinforce that upbeat, happy spring feel. If you have any weddings coming up this year and would like a very meaningful gift, please contact me about creating a bouquet painting for your special couple. This is a photo of the original bouquet. but usually I paint the bouquets from photo's after the wedding. Getting excited about my trip to Giverny, France, where Claude Monet lived and painted for over 40 years of his life. The workshop is now sold out and I've got my airline tickets, so will be on my way in June. Here's a small study getting prepared for painting in the garden. If you missed out of this opportunity, I have another workshop to an equally beautiful location in September, enchanting Lake Garda in Northern Italy. Click here to enjoy a one minute video of the area. Take a look at the beauty of this special place! For more information on the workshop click here. Contact me if you have any questions or are interested in joining in on the fun.